One of my favorite ways to read and study God’s Word has been to hand copy Scripture. I have been copying Scripture for about 3 years now and it, along with Bible Journaling, has completely changed the way I read and study the Bible. The only day I don’t write down Scripture is Sunday. My daughters have even taken to it, which is a beautiful thing. 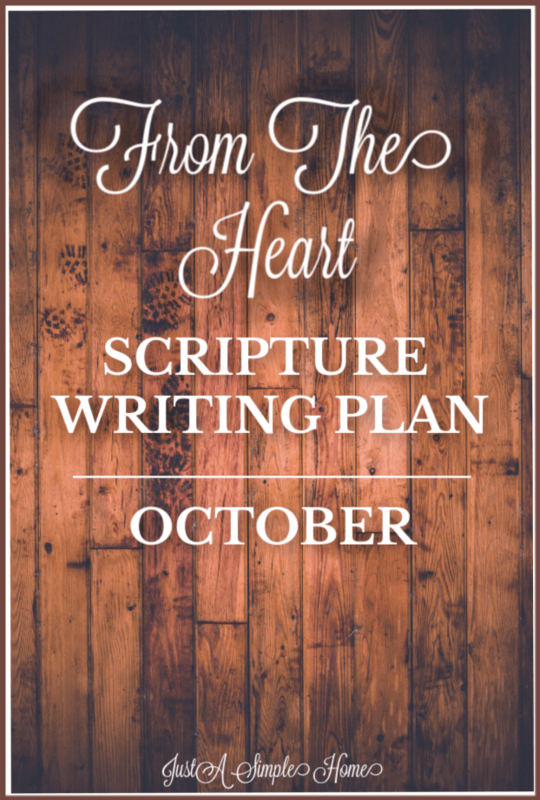 Writing down Scripture makes the words come to life in a powerful way. As a busy mom, I know I can be distracted by a million things when I read. It takes more concentration to write something down, right? Writing down God’s Word helps you engage another sense, so you are able to remember what you read more easily, and meditate on it throughout the day. The FROM THE HEART study is released each month, Lord willing, and is a topical study. During the month of October, we will be reading and writing about OBEDIENCE. This topic can be a tough one, ladies! We know we ought to obey, and we want to obey, but sometimes it just isn’t that simple. If you have read the book of Joshua, you may recall the story where one man took the possessions that belonged to the Lord when they invaded Jericho. This one sin caused a whole lot of trouble for the Israelites, didn’t it? The lack of obedience from one person caused the Lord’s anger to burn and His righteous judgement to be passed. Each of the Scriptures should take no more than ten to fifteen minutes a day to copy. Join me in spending fifteen minutes a day listening to God’s Word as He shows us what it means to truly walk in obedience with Him. I hope you join us! If you have the FROM THE HEART PRAYER JOURNAL, that is a perfect place to copy down these Scriptures. If not, just grab a any journal or pretty notebook will do. Let’s do this together! Comment in the monthly thread on Facebook or on Instagram so we can join together and hear God speak through us. I love this theme! It’s so important to understand why we need to submit ourselves in obedience to God. This is such an interesting concept. I have heard a lot about it lately, and that it would give more concentration. My mind is always doing at least 20 things at a time, but to read and write at the same time would slow my mind. I will have to try it!